Oh, Ubud. I love you for so many reasons. But I especially love that you make healthy vegetarian and vegan eating so easy and approachable — and most importantly, so damn delicious. If you’ve never been to Ubud, Bali before, then you still may have heard about a few of its strong points. They include, but definitely aren’t limited to, yoga studios galore, endless rice paddies, tons of outdoor activities, peace and quiet (yet also lots of action), and of course, a thriving healthy/organic/vegan/vegetarian foodie scene. Ubud and clean eating go together so perfectly that I’d almost consider it a crime to miss trying out a few of Ubud’s best organic, healthy restaurants. Even if you’re the furthest thing from a vegan, I promise you will love getting into that wholesome plant-based lifestyle — even if it’s only for a few days! Here are our top five picks for the best healthy restaurants in Ubud, Bali. *This post contains affiliate links. Find more information in our disclosure. It pains me to choose a favorite of all these healthy restaurants in Ubud. But if I had to, it’d probably be Watercress. With every bite of goodness, it’s apparent that Watercress holds firmly to its mantra: Eat fresh, live well. Watercress’s menu includes abundant salads, perfectly poached egg dishes, open-faced sandwiches, and big, flavorful burgers. 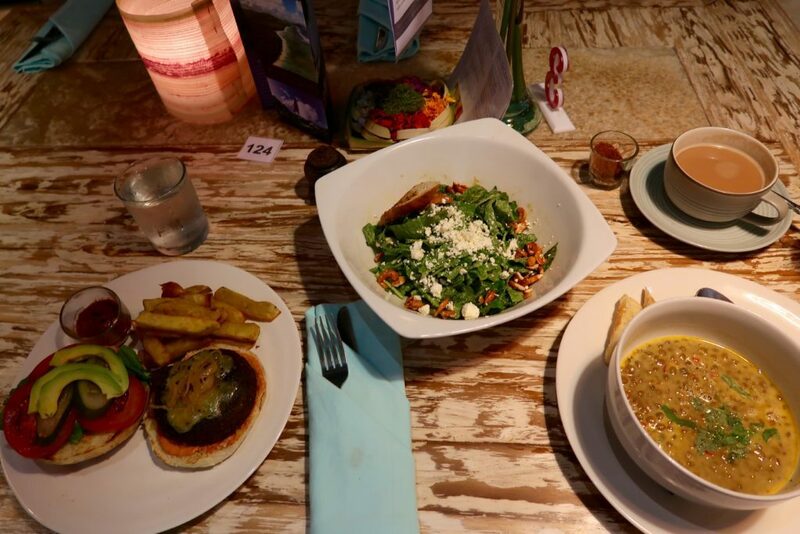 Watercress offers a variety of meat dishes, as well as loads of vegetarian and vegan options. sundried tomato, toasted seeds, pesto, feta, and herbs. No salad has ever been so delicious! Also pictured above is the Veggie Burger complete with leafy greens, carrot, beet, cucumber, tomato, house sprouts, hummus, and sweet chili mayo, as well as the Super Smoothie with cacao, maca, bee pollen, banana, coconut oil, and almond. YUM! Oh, and by the way, Watercress has a second location in Seminyak. Alchemy blew my mind. And I’m pretty sure that you will have a similar experience. How can raw vegan food taste that good? So good, in fact, that when you’re tasting Alchemy’s dreamy creations, you feel like you’ll never need or want non-vegan food again. 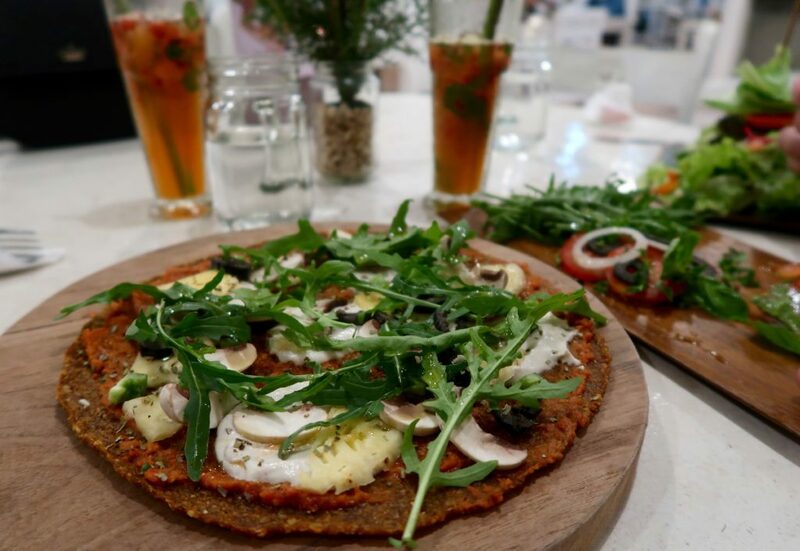 Alchemy’s raw vegan menu features lots of wholesome salads, main dishes such as pizzas, burgers, nachos, and sushi rolls, and the most heavenly desserts. Alchemy also has a ridiculously amazing salad bar like you’ve never seen before, filled with only the best seasonal ingredients. 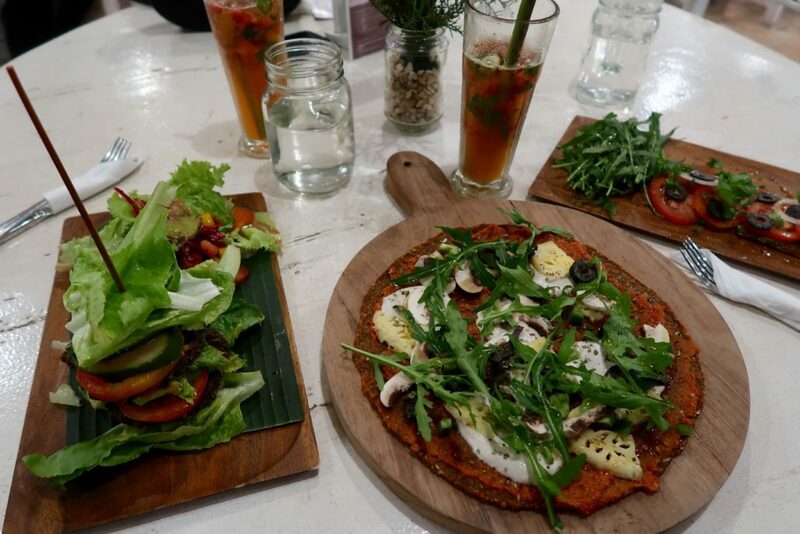 At Alchemy, I braved a raw vegan pizza, and somehow, it was one of the greatest gourmet pizzas I’ve ever had. Alchemy’s Aloha Pizza is made up of a sundried tomato crust and topped with marinara sauce, creamy cashew cheese, bright pineapples, green bell peppers, olives, mushrooms, and spicy arugula. We also tried out the Mexican Burger with mango, pickles, chipotle, almonds, and sunflower seeds; the Italian Bruschetta with herb crackers, pesto, olives, tomatoes, and onions; and lastly, Cloud 9, the most amazing vanilla cheesecake with raspberry coulis. I’m still confused (and amazed) as to how Alchemy is able to coax such complex, rich flavors out of their ingredients without actually cooking anything. It’s simply incredible and you’re going to love it. Kafe is one of my absolute favorite restaurants in Ubud, conveniently located in the city center. This trendy-rustic joint exists for travelers and locals alike who live healthy, eco-conscious lifestyles. 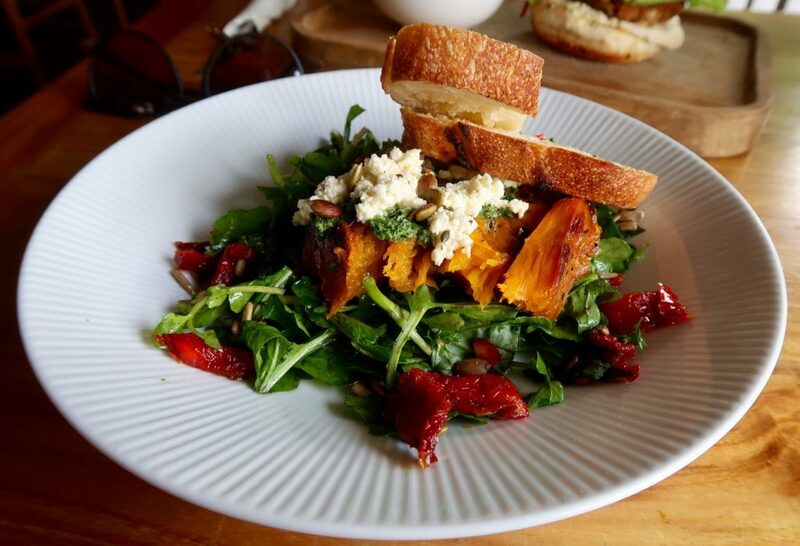 Sourcing its ingredients from local, chemical-free farms, Kafe delivers a fresh and delicious menu that includes vegetarian, vegan, and gluten-free items. 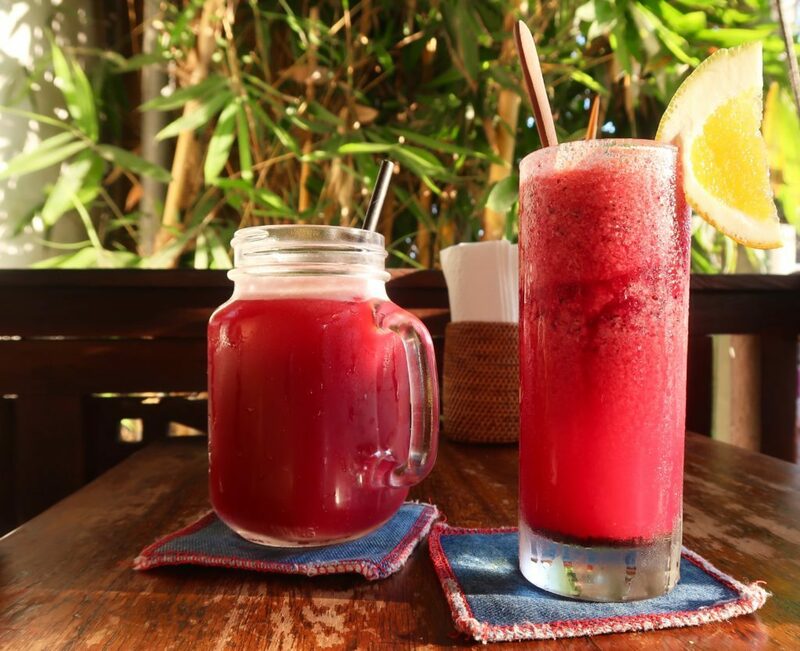 Kafe also prides itself on serving dishes from around the world, real espresso, and the healthiest juices, smoothies, and shakes on the island. Pictured above is a CrunchyBeetroot and Walnut Salad, the Mezze Plate complete with all the usual suspects (hummus, tzatziki, olives, and tabouleh, etc. 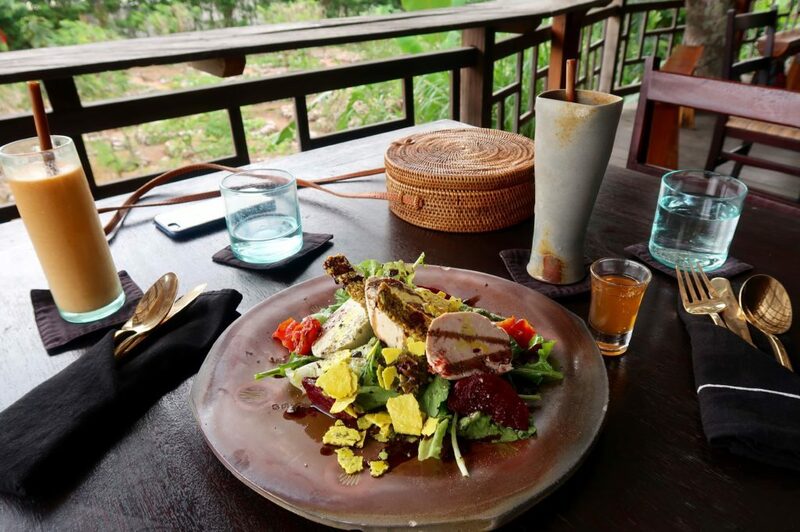 ), some fresh Vietnamese Salad Rolls served with creamy peanut sauce, a passion fruit-orange-beetroot-pineapple-honey smoothie, and lastly, some local Balinese red wine. 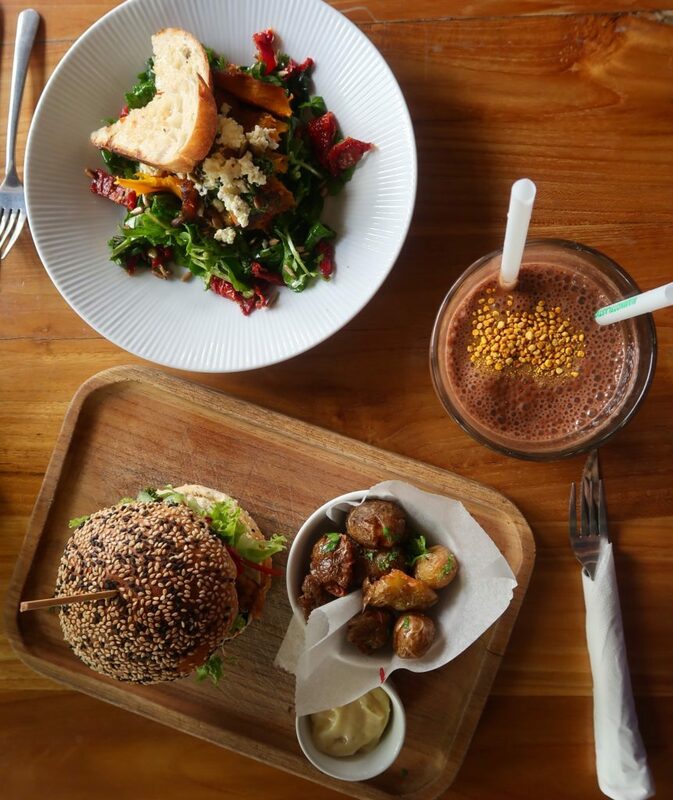 Try out Kafe’s 100% natural, organic, and local dishes, and you will not be disappointed. So delicious! Moksa Plant-Based Restaurant and Permaculture Garden is a vegan’s idea of food heaven, serving up only the most imaginative and flavorful vegan dishes. This healthy eatery focuses on sustainable, fresh, flavorful food, and sources ingredients locally — often, from its own garden. Whether you order some jackfruit tacos or a plate of lasagna, you can be sure to have a fantastic, filling vegan meal. Moksa lies in the Sayan area of Ubud, and at about an hour’s walk from our amazingly peaceful and friendly hotel, we decided to take a taxi to and from Moksa. Needless to say, off the beaten path, down dusty, winding roads is where you’ll find this place. When you enter the restaurant, you’ll feel an overwhelming sense of calm, surrounded by nothing but soaring trees, peaceful gardens, and beautiful wood elements. Isn’t this exactly the place you need in your Balinese vacation?! While there, we enjoyed the Moksa Cheese Trio with sundried tomato, kalamata olive, and arugula pesto cheeses; the Chef’s Bowl with green curry rice, eggplant rendang, kimchi, braised greens, sautéed mixed mushrooms, tempeh bacon, char sew tofu, and dabu-dabu, and topped with mixed greens; and lastly, the Vegan Cesar with fresh iceberg and romaine lettuce, sun-dried tomatoes, spiced pumpkin seeds, tempeh bacon, and nut parmesan cheese, tossed with homemade dressing. Obviously, it was all super yummy. First of all, Clear Cafe‘s interior presents one of the most artfully inspired, relaxed, and chill atmospheres I’ve seen. Between the restaurant’s hobbit-style front door, floor seating areas, endless greenery, wooden decor, and koi fish pond, you feel like you’re getting back to nature without actually leaving the city center. The menu at Clear Cafe is extensive, with dishes ranging from salads and sandwiches, to soups and seafood. There’s also a wide selection of Indonesian, Mexican, Indian, Thai, and Middle Eastern dishes. And of course, there are options for everyone: meat-eaters, vegetarians, vegans, and even raw vegans! Pictured above is a big bowl of Indian Lentil Soup with coconut cream, the vegetarian Love Burger with all the fixings, and my ultimate favorite, the Goat Cheese salad with mixed greens, beets, candied cashews, and a sesame-ginger vinaigrette! Clear Cafe is all about relaxing, having a great time with friends, and grazing on wholesome dishes. So go there, hang out, and enjoy every minute! 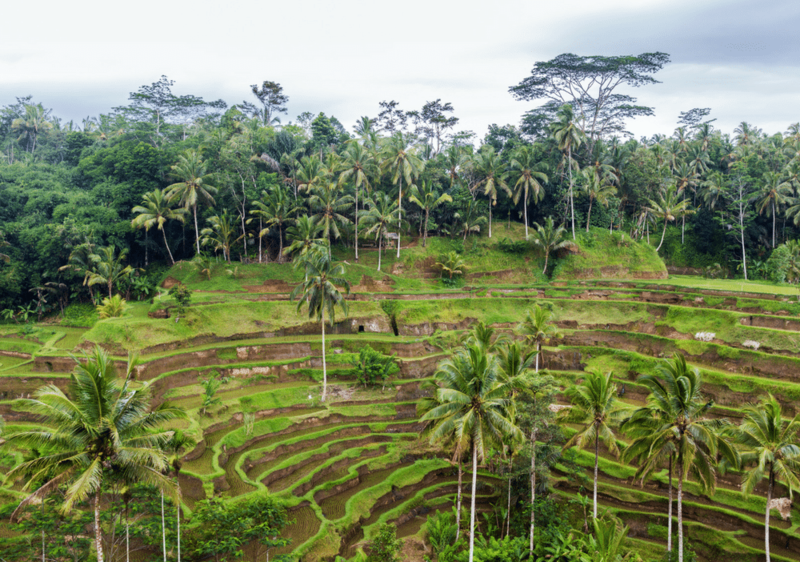 Between lush rice terraces and jungles, endless opportunities for hiking, biking, rafting, and yoga, walking around the many markets, and of course, eating at scrumptiously healthy restaurants, a trip to Ubud is great for your body, mind, and soul. The Ubud lifestyle is all about sustainability, health, happiness, and feeling good, so embrace it! Like I said before, Ubud’s health-conscious, yet delicious restaurant scene is on point. 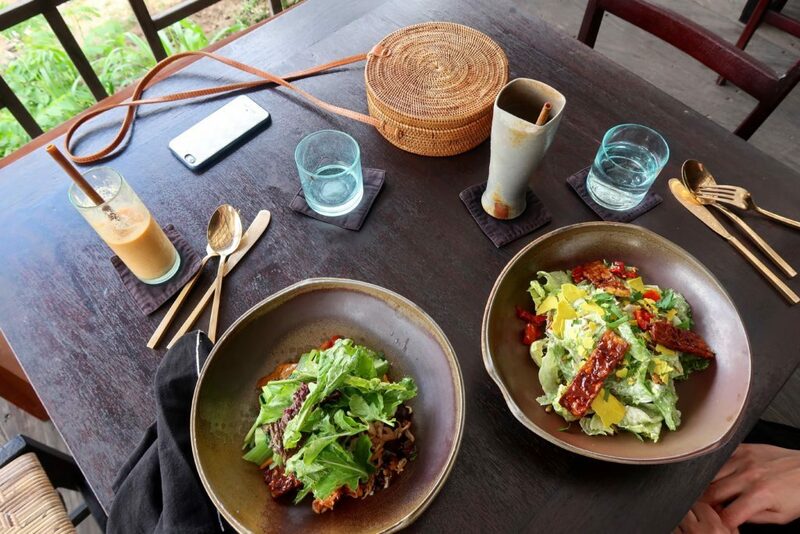 And whether you’re a vegan, a vegetarian, or a full-blown carnivore, you will love these five healthy restaurants in Ubud. I am absolutely sure of it! Have you been to Ubud, Bali before? 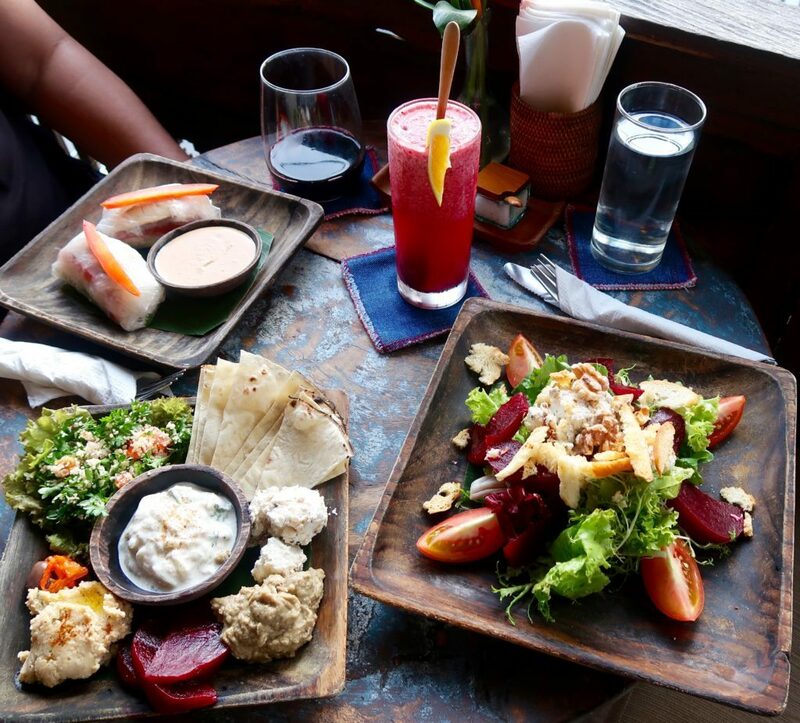 What are your favorite healthy restaurants in Ubud? Let us know in the comments below! « Hiking Bali’s Mount Batur at Sunrise: A MUST DO! These places all sound good, sadly I do not recognize them from when I was in Ubud last summer. Hope I get to visit Ubud again in the future. p.s. Where there any places with local food that could be in the cathegory healthy? In Ubud, this type of food would be considered “local food” by many. 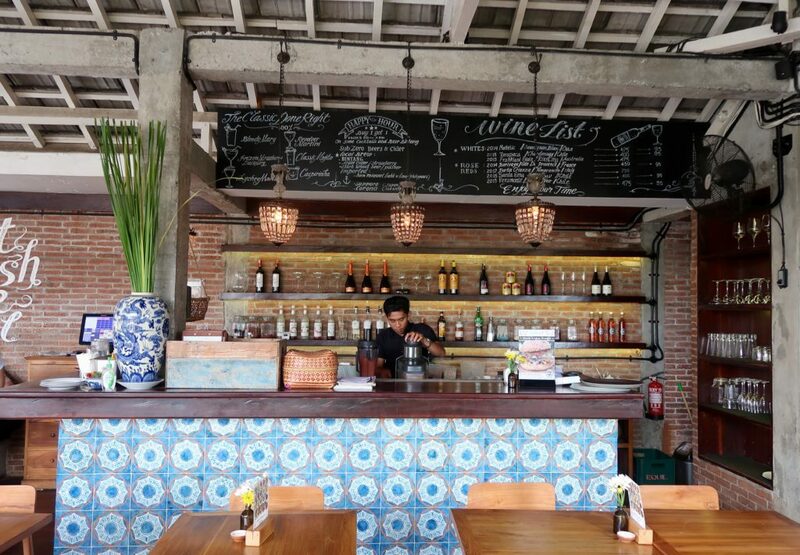 The current cafe culture in Bali is very much about fresh, health-conscious foods made with local ingredients — some of which are inspired by Balinese and Indonesian food, while others take inspiration from abroad. However, many of these cafes listed above do indeed offer typical Balinese and Indonesian options.